WoPC Home > U.S.A. > Paulson Playing Cards > Gemaco Playing Card Co. 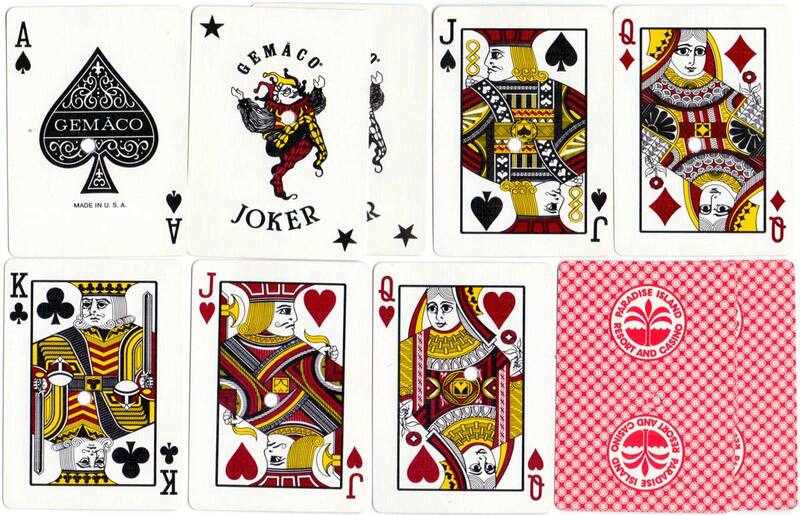 Above: ‘Gemaco’ playing cards custom-produced for the Princess Cruises Casino (on board ship one assumes). The courts include the logo of the Princess cruise line, which is rather unusual. The jokers were discarded when the deck was opened for play, as they were not required, and as such don't often survive. Images courtesy Matt Probert. At a certain point, cards are no longer in their preferred "mint" or nearly new condition. 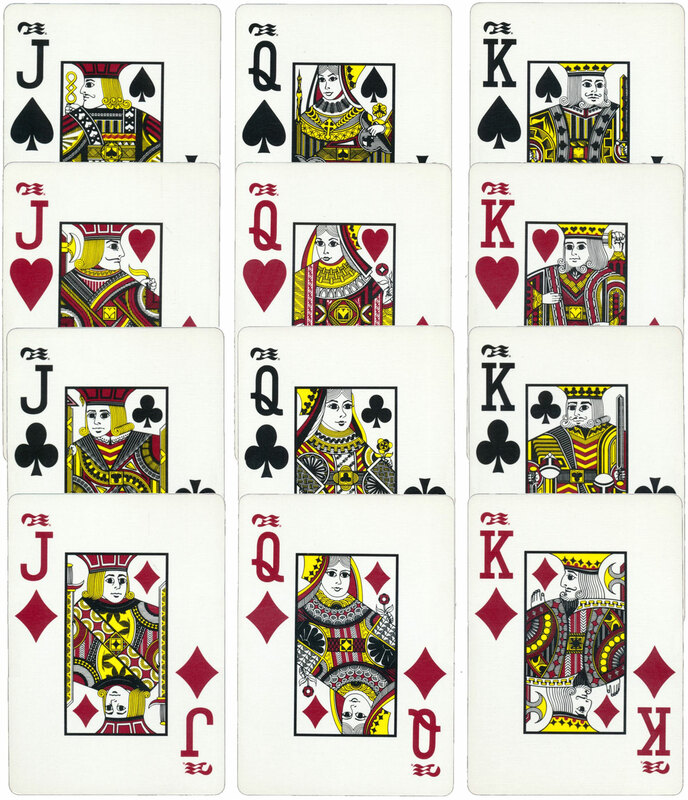 Casinos look to sell these used decks of cards to the general public, but before doing so they'll either burn the corners of the cards or puncture a tiny hole through them in order to prevent cheating. The cards being sold to the public look identical to the ones being used on the casino floor, so a tiny hole or a burnt corner will prevent any confusion between the cards sold to the public and the newer cards still being used at the casino. 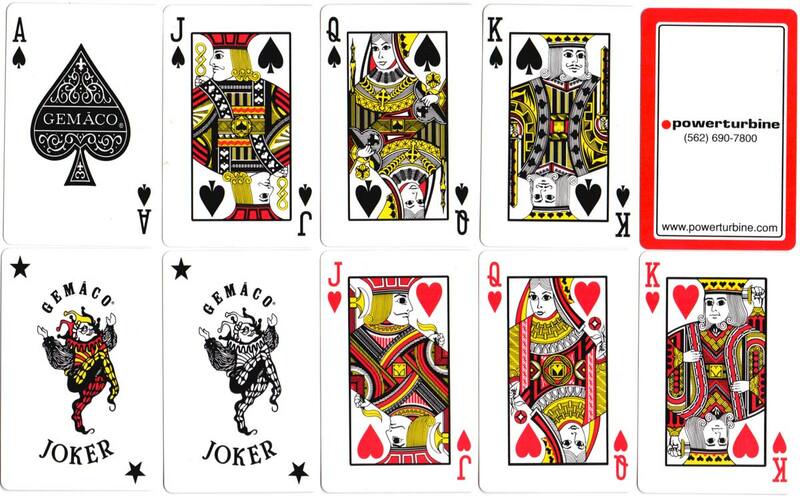 Above: cancelled ‘Gemaco’ playing cards produced for Hooters Casino Las Vegas, c.2000. The "Sentinel Security Series" face features a large letter/numeral in the index coupled with a slightly reduced centre configuration for maximum readability. This design was registered in mid-1999. 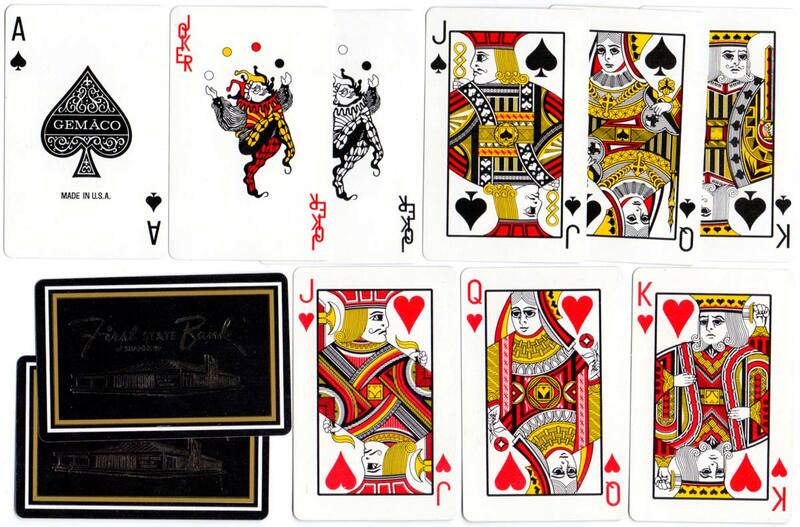 Above: hole-punched ‘Gemaco’ playing cards produced for the Paradise Island Resort and Casino by The George C. Matteson Company. 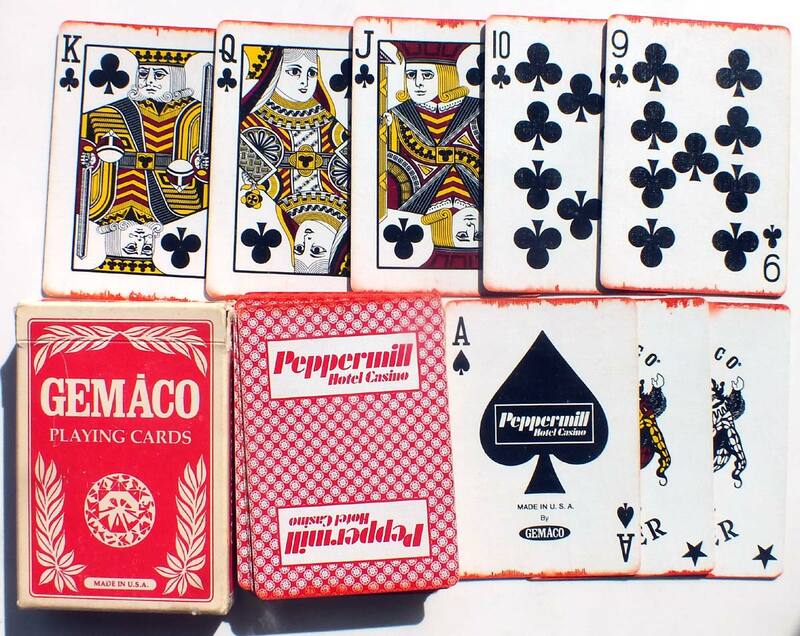 Above: ‘Gemaco’ playing cards produced for Peppermill Hotel Casino with a special custom ace of spades, which have been cancelled by marking the edges with red dye. Designed and manufactured by The George C. Matteson Company, 1990. 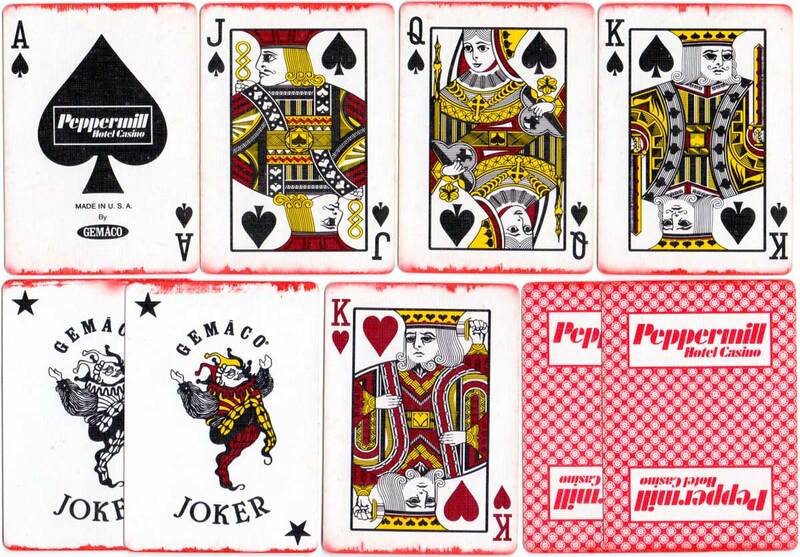 Above: ‘Gemaco’ playing cards produced for Powerturbine. Above: ‘Gemaco’ playing cards produced for the First State Bank of Shannon. Above: double deck of Gemaco Presidential playing cards produced for Rolls Royce, supplied in a black hard plastic tray box with clear lid. Image courtesy Matt Probert.